This report is written by Mr. Travelmista. When traveling abroad, you want to cease or inhibit data access of the local mobile (i.e. cell phone) data network because it is incredibly expensive if you are on a international plan. For example, as of 2012 it is around USD$20.00 per megabyte. That emailed picture of a cat riding a monkey just cost you $5.00. So, it is nice to jump on a WiFi hotspot whenever possible to get fast and at least relatively cheap(er) internet access. I find myself in a lot of international hotels (all for valid, business, and non-nefarious reasons of course) and most of them offer some sort of internet access. Sometimes the internet access is free. Sometimes it costs ~USD$20 per day. However, typically no matter how much it costs, it will be cheaper than using the mobile network data. However, amazingly enough, not all hotels of the world offer wireless internet access and instead may offer a single hard-wired Ethernet line in the hotel room (Asia especially). This presents a problem for connecting mobile device like a phone since they typically do not have Ethernet connections. So, what do you do when you carry 2 iPhones, an iPad, and a laptop (don’t judge) to connect them all to the internet? Enter Connectify <add a link>. The concept is simple. Your laptop typically will have an Ethernet connection as well as a wireless internet card in it. Why not connect the laptop to the Ethernet line to get internet access and then use the laptop’s wireless card to broadcast as a WiFi hotspot allowing your peripheral devices to connect and use the laptop’s internet access? I knew you were thinking of doing just that! That is exactly what Connectify does. 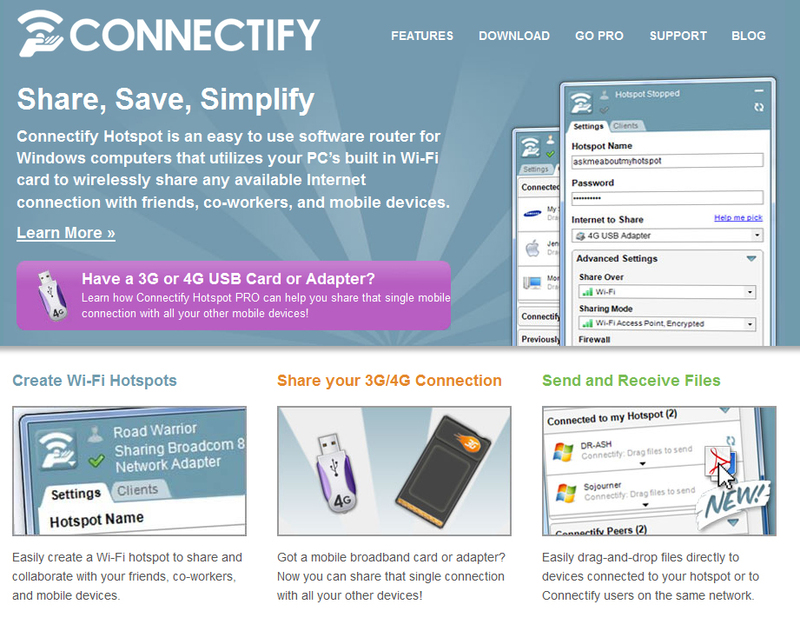 Connectify offers a free and paid for version of the software, but the free version will give you most features and get you up and running right away. I have used it many times abroad and it allows me to get wifi internet access (connecting through my laptop) for my iPhones and iPad. Setup is pretty easy and should be relatively plug and play. Connectify is also useful when the hotel provides both a wired and wireless connection but may charge you per device for the wireless connection. Using Connectify, you would just pay for the single wired connection to the laptop and then share the wireless to your mobile devices for free. I think it may also be possible to put two wireless network cards into your laptop, use one to connect to say a paid wireless connection (cough GoGo In-Flight Internet) and then use the second wireless card to share the internet access to your mobile devices for free. I haven’t tested this out yet but should theoretically be possible. This is probably against GoGo rules so try it at your own risk. Finally, if you encounter problems getting Connectify to work, make sure you are running the latest drivers for your wireless network interface card. I actually couldn’t get Connectify to work at first and after updating my drivers it has worked flawlessly. Check Connectify out at www.Connectify.me because it is completely worth trying free software.